GOLF FOR 2 INCL WITH YOUR STAY! 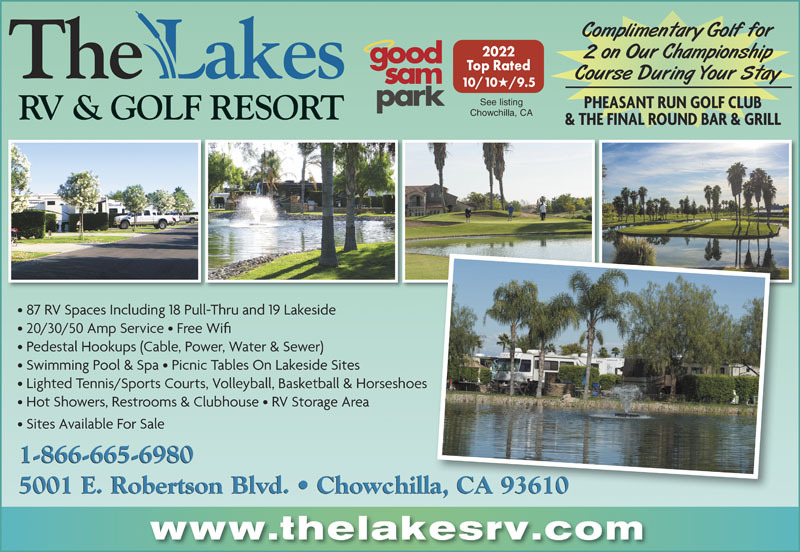 The Lakes RV & Golf Resort is in California's Heartland. Close to Hwy 99 an easy drive to SF, Napa, Yosemite, Tahoe & Monterey. 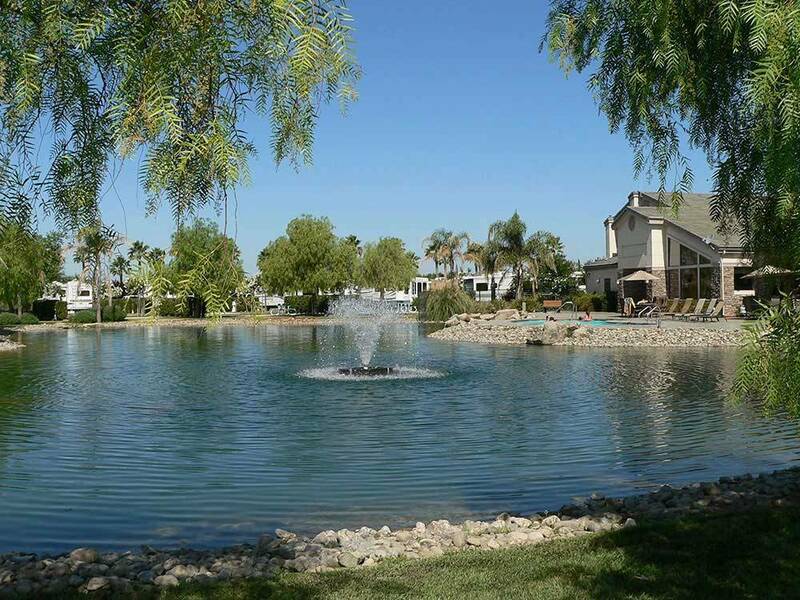 Tranquil lakes, refreshing pool & spa. Complimentary golf for two. Big Rigs welcome. We stayed a couple of nights passing through the area. This was our third stay. No changes from our last visit. Still a nice park even with the few weaknesses it has. We had to settle for a pull-in off the lake (pond) as none of the other sites off the lake (pond) were available. The park is a short drive from HWY 99 (Exit 170: Roberts Rd/26th Ave) along paved, 2 lane roads. The park has gated access so you’re given a remote to open the gate. The sites are a mixture of back-ins along the outer edge or pull-ins around the lake and P/T’s. The back-ins and pull-ins seemed to be the extended stay sites. The interior roads are paved. The site parking pads are concrete but there is significant bump to transition from the road to the pad similar to driving over a curb. Several of the parking pads are experiencing broken concrete. The interior roads and turns are wide enough to negotiate without much problem. The parking pads are narrow. The P/T sites were long enough for coaches & their toads. This park understands the simple concept of the importance of a flat, level site as the sites were level and flat. Distance or hedge rows establishes privacy between the sites. There are manicured grass lawns with the sites and throughout the park. They have full hook ups – water, electricity (50/30/20 AMP), & sewer. There were multiple utility connections hidden in the hedge rows which made accessing them difficult requiring a lot of hose/cord. The sewer connection was at the ground so it was easy to establish a downhill flow. Seem to remember there being an outside table. Only a few of the sites had fire pits but there was a common fire pit at the clubhouse. Curbside garbage pickup. There are a few trees scattered around the park so satellite reception would be dependent upon site assignment and your dish configuration. The park brochure show 24 channel cable line but made no mention of broadcast channels. Didn’t try to get any broadcast channels. The park provided WiFi was poor but occupancy was an estimated 90% due to a rally being held (long holiday weekend). Our Verizon WiFi hotspot worked well. Didn’t try the NET10 phone so don’t know about the reception. The designated fenced pet area was in a corner. It had a grass surface. There was a bag dispenser and waste collection station in the fenced pet area for waste. There was sufficient area to walk dogs along the park roads. But there weren’t any bag dispensers and waste collection stations around the park for waste. The clubhouse, pool & hot tub amenities and park’s appearance made this a pleasant stop over. We would stay here again if the need arose while traveling through the area. Don’t believe we would want to make it an extended stay site due to the limited shopping nearby and the complimentary round of golf for 2 per site per night. TIP: Really no bad sites. We prefer the P/T’s for short stays but would consider a back-in (#10-19) or pull in (#50) for an extended stay. Sites 20 - 42 were along the South edge of the park which had a line of tall trees that could obstruct satellite reception. There is a mobile detailing service available to wash your RV. WOW! This is a beautiful park. The grass was in need of watering to make it lush and green but if you at all familiar with California you know most of the summer months water is an issue. The park explained to us right up front that not only are they on a 1 day a week watering ration but that the city is experience some water pumping issue. They advised us to fill our water tank (in their park) and use our pump if the pressure in the park suddenly dipped. A problem? NO An inconvenience maybe, but we did as they suggested and have not missed a lick. The restroom are spotless and beautiful. The pool over looks a "lake" that is equal to one at a Palm Springs Resort. The plus here is IF you are a golfer, you receive a free round of golf with your stay. Very nice place. Good level concrete pad sites. Adequate spacing between sites. Short shrubbery for spacing. Paved roads. Felt safe and secure here. Nice showers and bathrooms. We normally do not use bathrooms/showers in parks, but had to this time as the water pressure to the RV was extremely low. Front desk mentioned this at check in, but I didn't realize it would be so low! Some spots had a picnic table. Others do not. Did not ask why as we did not need one. Due to low water pressure, I would pass this place up if staying longer than a few nights. The entire facility is beautiful. Did not play golf. Hot tub needs cleaning.Foamed up with jets on. Men's bathrooms cleanliness fair according to hubby. Women's bathrooms very nice. My other thing to consider here is air quality for those with breathing issues. There was an odor to the air here. So I spent very little time outside. I loved staying here. The sites were level, concrete and spacious. They have a gorgeous pool & spa, the people in the office are very friendly and helpful. I didn't use the restrooms/showers, so can't comment, the laundry room was clean and reasonably priced. Security was excellent. You get a clicker to enter the premises, the gates open automatically when you exit. Wifi was very good, you could have 5 devices on it at once, so everyone was happy. Overnighters are offered a round of golf for free at their grounds. Decent grocery store nearby as were restaurants. Easy on/off SR99. I'll visit again. Wow what a great place. Beautiful pool and spa great landscaping and if you stay here you can golf for free! yep free! The staff was very helpful and friendly! I will definitely stay here again and let all of my friends know about it also. We stayed a couple of nights passing through the area. This was our second stay here. Apparently we didn’t rate the first stay. The park is a short drive from HWY 99 (Exit 170: Roberts Rd/26th Ave) along paved, 2 lane roads. The park has gated access so you’re given a remote to open the gate. The sites are a mixture of back-ins along the outer edge or pull-ins around the lake and P/T’s. The back-ins and pull-ins seemed to be the extended stay sites. The interior roads are paved. The site parking pads are concrete but there is significant bump to transition from the road to the pad similar to driving over a curb. Several of the parking pads are experiencing broken concrete. The interior roads and turns are wide enough to negotiate without much problem. The parking pads are narrow. The P/T sites were long enough for coaches & their toads. This park understands the simple concept of the importance of a flat, level site as the sites were level and flat. Distance or hedge rows establishes privacy between the sites. There are manicured grass lawns with the sites and throughout the park. They have full hook ups – water, electricity (50/30/20 AMP), & sewer. There were multiple utility connections hidden in the hedge rows which made accessing them difficult requiring a lot of hose/cord. The sewer connection was at the ground so it was easy to establish a downhill flow. Seem to remember there being an outside table. Don’t remember fire pits but there was a common fire pit at the clubhouse. Curbside garbage pickup. There are a few trees scattered around the park so satellite reception would be dependent upon site assignment and your dish configuration. The park brochure didn’t show any cable or broadcast channels. Didn’t try to get any broadcast channels. The park provided WiFi was excellent but occupancy was low. Our Verizon WiFi hotspot worked well. Didn’t try the NET10 phone so don’t know about the reception. The designated fenced pet area was in a corner. It had a grass surface. There was a bag dispenser and waste collection station in the fenced pet area for waste. There was sufficient area to walk dogs along the park roads. But there weren’t any bag dispensers and waste collection stations around the park for waste. The clubhouse, pool & hot tub amenities and park’s appearance made this a pleasant stop over. We would stay here again if the need arose while traveling through the area. Don’t believe we would want to make it an extended stay site due to the limited shopping nearby and the complimentary round of golf for 2 per site per night. We just bought our new Class A and wanted a quick overnight stay to get acclimated to the unit. I called this resort same day and made a reservation for a lakeside pad with full hookups 3 hours prior to arrival. The staff was friendly and accommodating and explained the price options. I chose a "lakeside" pull in for $60 after GS discount. The "lake" was actually a pond but the next morning I woke up early and caught two crappie and a bass so no complaints. They did say they stocked the lake. The hookups and pad were clean and inviting. We didn't use any of the other facilities so can't comment. We didn't have time to golf but apparently golf is included with your stay and I love this track at Pheasant Run. We will definitely be back!